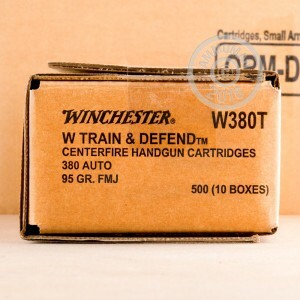 Get plenty of practice with 500 rounds of this excellent training ammo from Winchester! 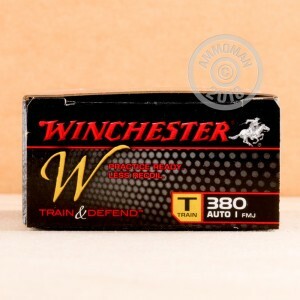 This 380 Auto Winchester Train & Defend ammunition was designed especially for the new shooter in mind. It was designed with a simple, straight-forward system to reduce the amount of recoil you feel from your firearm. This is important, particularly when you are a new shooter and need to get lots of practice with your self defense weapon. The 95 grain full metal jacket projectile will work well in both indoor and outdoor range training scenarios. 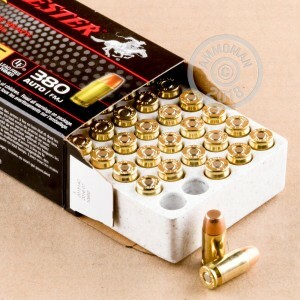 You will get a muzzle velocity of 950 feet per second with this low recoil ammo. Even though this line was designed with less recoil, it still has the same point of impact as other self defense rounds by Winchester. Anytime you buy Winchester brand ammunition, you can trust that you are getting the best money can buy. They have been around since 1866 and continue to produce high quality, reliable, yet affordable ammunition. They market and sell to shooters, hunters, military, and law enforcement professionals worldwide.